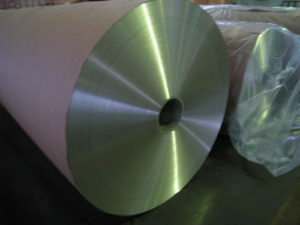 The raw material of aluminum strip is pure aluminum or aluminum alloy casting roll, hot rolled aluminum coil, and the sheet aluminum coil with different thickness and width is rolled by cold rolling mill. According to the application, the aluminum strip is divided into different width through longitudinal shearing machine. Due to the different surface finish of the aluminum box rolls, the light reflectivity of the aluminum strips is also different. When the surface of the aluminum strip is rough, the reflectivity is significantly affected by the wavelength of the irradiated light, and the overall tendency is that the reflectance increases as the wavelength increases. Single-sided aluminum foil is the opposite. Aluminum strips have entered all aspects of our lives. Everyone should know about aluminum strips. The specific uses of aluminum strips are: transformer aluminum strip, high-frequency welding hollow aluminum strip for hollow aluminum strip, aluminum strip for finned heat sink, aluminum strip for cable, Aluminum strip for stamping, aluminium strip for aluminium edge strip, etc. At present, the raw materials of electronic products in the world no longer rely solely on copper tape. Because the conductivity of aluminum is only lower than that of copper, it is becoming a popular trend to replace copper tape with aluminum strip.